If you have attended your computer science classes and enjoyed there, then you know that we can use Stack to convert a recursive algorithm to an iterative one. I'll use the same technique to print all leaf nodes of a binary tree without recursion. Pop the last node from Stack and push left and right child of the node into Stack, if they are not null. If both left and right children are null then just print the value, that's your leaf node. Seems easy right? Well, once you know the solution everything looks easy but until you find the solution you struggle even on common steps. If you are like many developers who understand recursion but don't know how to come up with a recursive solution, then I suggest you join a good course like Data Structures and Algorithms: Deep Dive Using Java on Udemy, it's one of the best course to learn and master data structure and Algorithms. Here is the complete Java program to print all leaves of a binary tree without using recursion. this example uses a Stack to store tree nodes during traversal and print the leaf nodes, for which left and right subtree is null. The logic used here is similar to pre-order or post-order traversal depending upon whether you first check left or right subtree. If you are interested in solving more binary tree based problems then please check the Cracking the Coding Interview book. It has the biggest collection of data structure and algorithm problem including binary tree and binary search tree from tech interviews. Anyway, here is the binary tree we'll use in this example, you can see that there are four leaf nodes in this binary tree-like. d, e, g, and k.
Once you run the below program, you will see it prints the leaf nodes as d, e, g, and k. Btw, if you are preparing for a job interview or new in the programming world, I also suggest you join a good course You should also read a good book on Data structure and algorithms like Algorithms and Data Structures - Part 1 and 2 on Pluralsight to learn more about different tree traversal algorithms. And, If you like books then the Grokking Algorithm by Aditya Bhargava is another good one to understand Recursion and elementary data structure. I was reading it from the last two weekends and I have thoroughly enjoyed its approach via real-world examples of Algorithms. 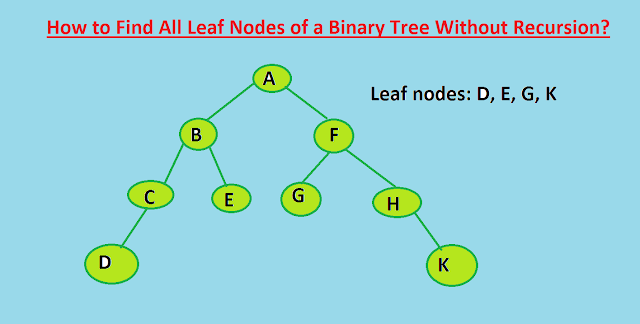 That's all about how to print all leaf nodes of a binary tree in Java without using recursion. You can use this solution anytime but especially when an interviewer asks to solve this problem using iteration or loop. The order of leaf nodes will depend whether you first check the left node or right node, just in case of pre-order and post-order traversal.